I love Christmas books...I use the excuse that they are for my kiddo, but in all honesty, I love them for me as well. I'm always on the hunt for new books that tell the Christmas story. The First Christmas Ever was a wonderful telling of the Christmas story. It was also very Biblically accurate. 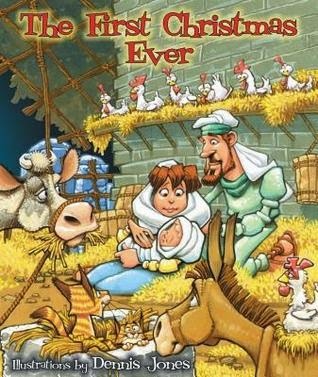 It drives me nuts when I see the wise men visiting baby Jesus at the stable, that isn't what is mentioned in the Bible, so I was thrilled to see this book portray Jesus at the right age.I know it's easier for kids to see all the things happening together, but I enjoyed how the story flowed and showed Jesus as a toddler when they arrived to his home. I also enjoyed how the story didn't end there but it made sure to let the kids know, that this story is only the beginning. Jesus was here for more and His birth and Christmas mean so much more. The illustrations for this story were great. It had a bold appearance and the characters really popped and it enhanced the the imagery of the story. The colors were fantastic as well. They were bright and eye catching. My littles loved all the animals featured. She also enjoyed spying the little details that were drawn into the background. This book would be a wonderful addition to any Christmas collection.